Growing up, I could always count on Little House on the Prairie to be on TV. My mom thought Michael Landon was just so dreamy. And he certainly was! My mom would have been too young for I was a Teenage Werewolf, but young Landon here is Dream Boat in all its proper noun glory. His puppy dog (har har) eyes and sweet face make for a compelling star of a tragedy. Landon plays Tony, a troubled teenager with a hot temper. After getting into yet another fright at school, one of the police officers suggests that Tony goes to see a psychologist for help. The young boy shrugs off the suggestion, and refuses. Later, Tony and his girlfriend Arlene go to a haunted house Halloween party where the kids spend the night playing pranks on each other. It’s all fun an games until they decide to prank Tony. He snaps and attacks his friend Vic. After seeing his friends’ stunned faces, Tony finally realises that he needs help. Tony goes to see Dr Alfred Brandon. The doctor suggests that he give Tony a sedative, and the boy reluctantly agrees. While he’s under, the doctor talks to his fellow psychologist, Dr Hugo. He tells Hugo that he’s going to use his serum on Tony, which causes Hugo to become uncomfortable. The experimental serum, mixed with hypnosis, will cause Tony to regress to a more primitive state, where he will gain back his savage instincts. Dr Alfred tells Hugo that he wants the human race to go back in time before it destroys itself. Dr Alfred injects Tony with the serum, and tells Tony that he’s a wild, killing animal. When Tony wakes up, he’s seemingly fine and goes off on his way. That night, after another party at the abandoned house, one of Tony’s friends is attacked and killed. At the police office, the officers are confused by the attack. One of the janitors sees the photos of the crime scene, and claims that he’s seen those types of attacks in his old village done by werewolves. He tells the officer that a werewolf is a man possessed by a wolf (rather than one than can simply turn into one). As the appointments with Dr Alfred continues, Tony becomes increasingly worried about his behaviour, but the doctor comforts him. Later, the principal at his school confirms the doctor’s sentiments by complimenting Tony on the turn around in his personality. It’s all sweet and all until Tony stops to watch a girl practise gymnastics. While watching, the school bell goes off, triggering his transformation into a werewolf. Tony attacks the girl and kills her, only this time he’s caught in the act by several students and his principal. Despite looking rather wolf-y, they can identify him by his distinct jacket. When the principal reports the death to the police, she gives a nearly solid confirmation that the werewolf was indeed the young boy. A wolf-hunt begins and Tony spends his time in the woods, evading the men looking for him. Dr Alfred, Tony’s father and Arlene’s family are all interviewed. The later two are kept under police watch in case Tony tries to contact them. In the morning, Tony awakes to find that he’s returned to his boy-form. He goes to a phone booth and calls Arlene. Despite her not confirming his identity, the police are able to track Tony down. But Tony has time to visit the good doctor one last time to beg for help. Doctor Alfred puts Tony under sedation, and Alfred tells Hugo that he will finally get the proof that his experiment has worked. The two doctors set up a camera to film Tony, but while they film, the phone rings and sets off Tony’s transformation. As a werewolf, Tony attacks and kills both of the doctors. The police arrive shortly after and shoot Tony. Only when he dies, he has reverted to his normal boy form. 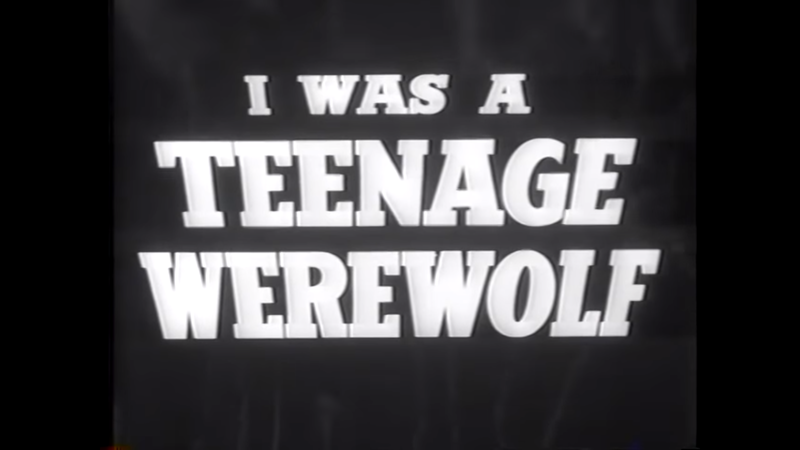 I Was a Teenage Werewolf is one of the quintessential 50’s horror monster movies. The drive-in types that were meant to be shocking and sensational. Of course it’s difficult to find any of this shocking decades later, but the movie still holds charm and is still incredibly watchable. It would have been great to get some footage of Tony improving as a child instead of just taking the principal’s word for it. Tony became less of a focal point as the movie went on, and he slowly just became background to the story. The police (which included the fabulous Barney Phillips) had a bit too much screen time. Police solving crime. We get it. There’s a bit of a 50’s “lesson” here that the raucous teenage lifestyle that was emerging post-World War II was somehow dangerous. Or rather, making fun of those who believed that sentiment. Without discipline and good behavior, any kid could turn in to a beast. You know, Blackboard Jungle and all that cal.